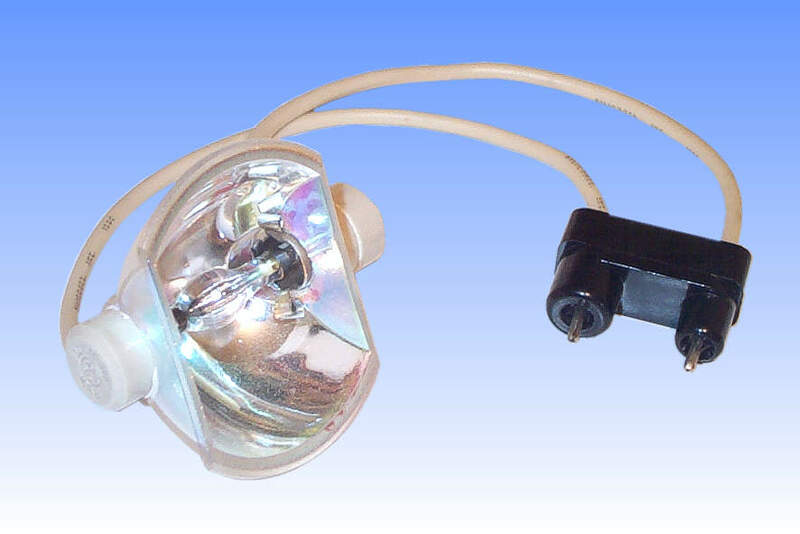 The GE family of "Marc" and "Gemini" lamps are short arc metal halide products, which were developed during the 1970's specifically for the projection of 16mm films.They are characterised by the very short arc gap, made possible by operating the lamp at very much higher pressures than would normally be encountered - typically in excess of 50 atmospheres. All types are intended for DC operation, hence the asymmetric appearance of the arc tube to account for the different electrode sizes. Despite being made from quartz and with no front glass, a unique feature of these lamps is that they generate no UV output. This is owing to the high concentration of indium bromide in the arc tube, a useful feature of indium being that its vapour absorbs radiations below about 380nm. Consequently any UV emitted in the arc is absorbed by the indium vapour in the arc tube, and is unable to be transmitted. The arc tube in this later design lamp is unusually mounted transversally in the reflector, thus ensuring that there is no hole in the rear of the reflector, the region which is most important for directing light forward efficiently. Electrical connection is by means of a special 2-pin plug, asymmetrically designed to ensure that the correct arc tube polarity is maintained. A dichroic coating on the mirror delivers a cool beam of light forward, while allowing some 60% of the heat to escape out the rear of the lamp.